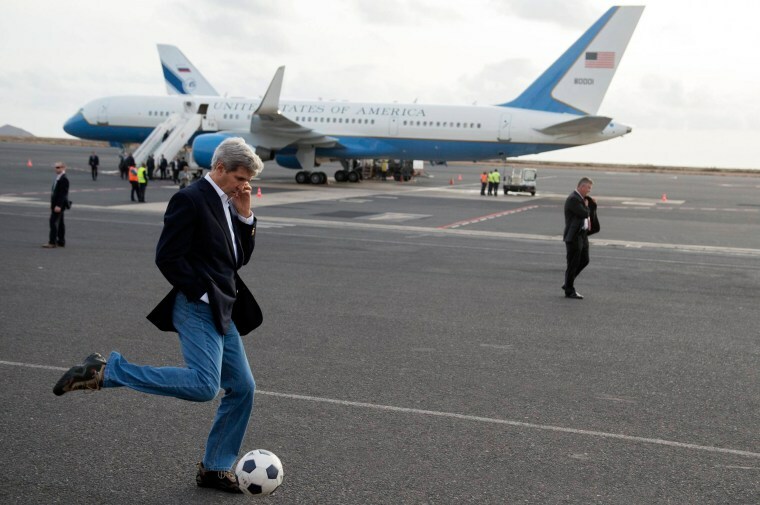 Secretary of State John Kerry kicked a soccer ball around the tarmac Sunday after his plane stopped to refuel in Cape Verde, an archipelago off the west coast of Africa. It's not the first time Kerry has been pictured with a ball. In March, he had an impromptu kick-around with his Russian counterpart Sergey Lavrov as the pair negotiated over the crisis in Ukraine, and a year earlier the Secretary of State showed off his heading skills during a photo call in Afghanistan. According to a 2004 article in the Los Angeles Times, Kerry's passion for soccer was a "deep, dark secret" for a long time. The paper speculated that admitting to being a fan of the decidedly un-American game could prove "bad politics" for the then presidential candidate. Classmates said Kerry, a keen player in his younger days, was nicknamed "The Diddler" by his school coach due to his tendency to dawdle on the ball rather than pass to a teammate.